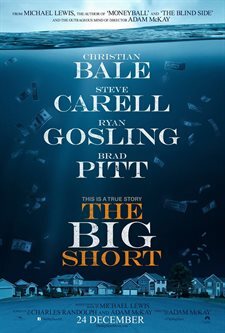 Download The Big Short in Digital HD from the iTunes store. 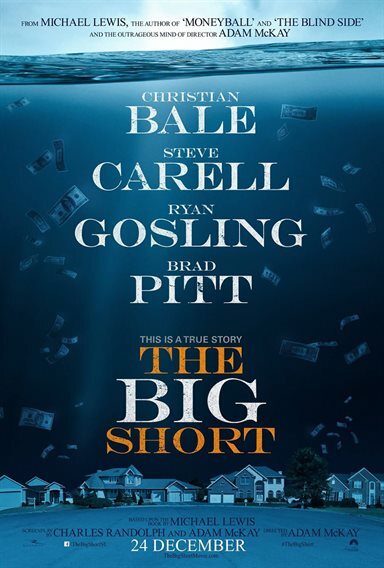 The Big Short images are © Paramount Pictures. All Rights Reserved. It's not an easy subject. Sure, we all know about the "real estate bubble burst," and how it has drastically affected the economy. The lives of so many have been forever changed. However, the details get fuzzy for most. The terminology, at best, is incomprehensible ("collateralized debt obligation"); and, it gets murkier from there. That's where Adam McKay, the film's director, brilliantly eliminates the fourth wall regularly during the film to help explain what things mean to the audience. Ryan Gosling is Wall Street banker Jared Vennett, as well as, our narrator. Throughout the film, he stares straight into the lens and addresses the audience...holding our hand through some of the tough talk. Gosling, along with a few celebrity cameos (a "real" housewife, a pop starlet, and a "chef"), help simplify subject matter that might otherwise be a drab cure for insomnia. Christian Bale is money manager and eccentric genius Michael Burry. Burry stumbles upon the reality of the booming mortgage industry. He creates a financial (gambling) instrument that will (and, did) "short" the housing market. In the film, Vennett (Gosling), uses a tower of tumbling Jenga blocks to describe the concept, and, persuade hedge-fund manager Mark Baum (Steve Carell) to invest millions. Baum and his team (Jeremy Strong, Hamish Linklater and Rafe Spall) embark on an expedition of their own to discover the truth. Their research takes them to Florida (the epicenter) where they interview slick brokers that exemplify the "salesman" stereotype, and home buyers who are grossly (read RIDICULOUSLY) under-qualified. It seems ludicrous in the film, but I can recall my astonishment when I ventured into the financial sector for a spell. I assure you as absurd as it all sounds and appears, the portrayals in this film are very much real. Inevitably, the audience will cheer on these characters. They are uncovering a dark truth...the "under-belly" of the beast, if you will. Make no mistake, however, these are not the heroes of the story. There aren't any in this one. Sure, they busted the industry wide open, and called it "to the mat," but they reaped the extraordinary and repulsively greedy benefits while the masses fell to their knees. They are in many ways much like those who birthed and nurtured the beast. In spite of this, we can still feel the angst and guilt that is assumed. Thanks in large part to an illuminating performance by Steve Carell as Baum. The industry, the reality, and the characters have all been exceptionally brought to life brought to life by an arsenal of actors in some of the best performances of their careers. (Nominations abound as this goes to print...post...whatever. Also, check out my interview with Jeremy Strong.) Per usual, forgive the digression. The shame I blame is partially mine. It is Michael Burry's and Mark Baum's. It is that of the "big banks." It is that of the masses...for not realizing that the diamond mine was not worth a dime. It is that of the average person for allowing their own small personal greed to blind the absurdly nonsensical that stands before them. Educational and enlightening would be an apt description were it not hidden beneath a highly entertaining, and darkly comedic film. It might be the star value that brings the audiences into the theatre, but the high quality creative execution will keep them riveted in their seats. Based on Michael Lewis' (The Blind Side, Moneyball) best-seller and true story The Big Short: Inside the Doomsday Machine, the film's screenplay is just as intriguing and brilliant; and, masterfully directed by Adam McKay (Anchorman, Step Brothers). Your time and money will be well spent on this cautionary, historical tale.